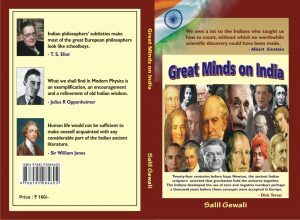 Great Minds on India is a masterpiece book written by Eminent Writer Salil Gewali. Obviously, India is highly esteemed in the world due to its unique culture and spiritual wisdom. Thus Indian Scholars & Rishis have openly disclosed Physical Science and Discovery in front of the world from ancient times. Afterall we want to talk about a documentary recently released based on this world-acclaimed research-based book GREAT MINDS ON INDIA/ “भारत क्या है” by an eminent scholar from Meghalaya – Shri Salil Gewali. Hence, the documentary is a humble effort to showcase India and her UNIVERSAL wisdom in the eyes of world-renowned scientists, philosophers, writers, poets, and statesmen. As a result of the book GREAT MINDS ON INDIA that first published in Xerox format in 1998 by Mr. Gewali, brought out in the regular print format in 2009. While the book has been aptly edited by a former NASA scientist – Prof. A.V. Murali of Houston, USA, the preface of the book has been penned down by another world-acclaimed NASA Chief scientist – Dr. Kamlesh Lulla, Texas, USA. So far Great Minds on India has already been translated into eleven languages. Why not let’s have a glimpse to this documentary Great Minds On India. Before watching the documentary, let’s read Some of the quotes which were said by World famous scientists, philosophers, writers, poets, and statesmen. Most Eminent Scientist Albert Einstein – We owe a lot to the Indians who taught us how to count, without which no worthwhile scientific discovery could have been made. Arthur Schopenhauer, One of the great German Philosopher and writers – In the whole world there is no study so beneficial and so elevating as that of the Upanishads. It has been the solace of my life, and it will be the solace of my death. They are the product of the highest wisdom. The book is a collection of the thoughts and quotes of world-renowned personalities on India’s cultural heritage and ancient wisdom. In this book Gewali described how the ancient literary wisdom inspired the thinkers, scientists and writers from the western world.